When I woke up this morning I could feel a lump next to me on the bed (no not my wife. She was on the other side). Assuming it was our dog, Harley I reached out to stroke him. As I did so he made a most un-Harley like noise and I realized that it wasn’t him. It was our cat Gypsy. Aha, I thought, he must be on the other side of the bed next to my wife. I looked up and he wasn’t there. To my surprise I saw him curled up right next to the cat. This is something new. 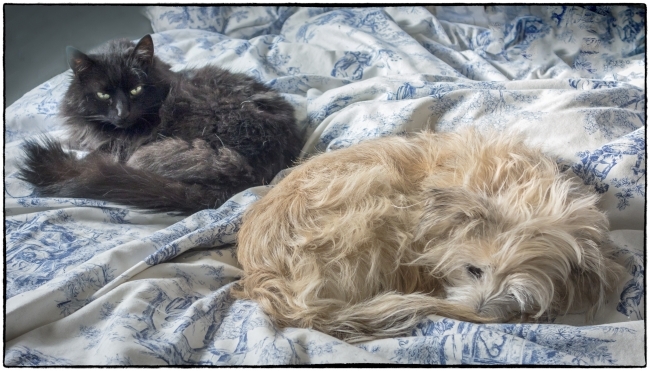 Our previous dog, Jackson was very territorial and, even though he never tried to hurt our cat he, he wouldn’t allow her into his space, which included the bed. If she did venture into his territory he would chase her off. Harley is much more tolerant and over the four months we’ve had him they’ve been getting closer and closer (becoming more friendly as well as getting physically closer).